Buy Now to enjoy more features - Access more IPs and choose IPs from more countries. Privacy Package: This package helps you avoid from online privacy disclosure with easy-to-use but powerful tools. Hide IP Easy: Protect your privacy easily on the Internet. Clear Cookies Easy: Clear all unwanted cookies with a single click. Clear History Easy: Easily clear all your online and offline activity history. Hide IP forever with no limitations. The Serial Number will be sent immediately after your order is successfully placed. 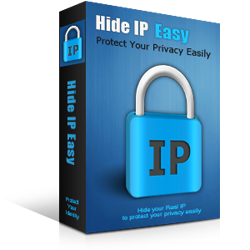 * Hide IP Easy can be installed and used on only one computer exclusively by the user who purchased the license.